It's been a while since I posted so I thought I'd show you some of the quick cards I've made this week. This is the first set I made with the Wonderful Favourites, a set I've had for quite some time but never used. I'm sorry about the quality of the photo, it was taken at night time and as you can see, I'm struggling with the shakes at the moment. * Wonderful Favourites Stamp Set. * Chocolate Chip Stamp Pad. * Chocolate Chip and Whisper White Cardstock. Good Morning Sunshine DSP. * Wide Chocolate Chip Grosgrain Ribbon. It's that time of year again when we celebrate Sale-A-Bration. 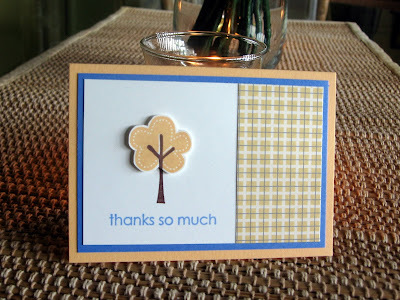 For those who are new to Stampin' Up! this is where we give you a free stamp set from our Sale-A-Bration catalogue for every $100 you spend on regular or mini catalogue purchases (excluding P&H). This year the Sale-A-Bration sets are fantastic, so please click on the picture to see the full Sale-A-Bration catalogue. What's more, if you host a Stampin' Up! party during Sale-A-Bration and sales exceed $600, the hostess can choose a Sale-A-Bration stamp set in addition to her regular hostess benefits. We also have a second promotion running at the moment which supports the Haitian Disaster Relief. 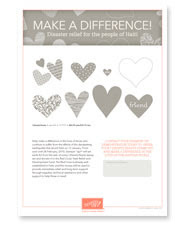 If you purchase the I Hearts stamp set for $42.95, Stampin' Up! will donate $2 of each stamp set sale to the American Red Cross' Haiti Relief and Development Fund. For more details on this, please click on the picture below. For more information or to place an order please contact me at jasner5@bigpond.net.au. Stampin' Up! are offering some great deals on selected stamp sets - INCLUDING SOME ALPHABETS, to make way for more inventory. 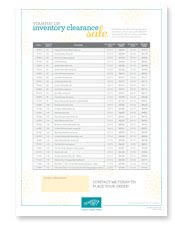 Click on the above link to see the full list of items and contact me ASAP (by phone or email jasner5@bigpond.net.au - make sure you leave a return phone number or email address) to place your order if you want anything listed as stocks are strictly limited. Also, I now have an official Stampin' Up! website which I will be updating regularly with specials etc. 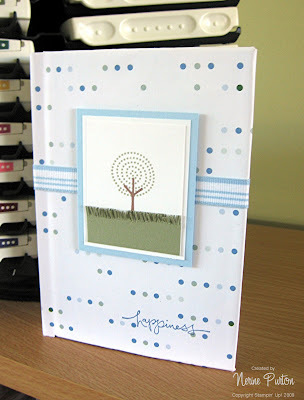 Check it out at http://www.stampinaddiction.stampinup.net/. There will be featured creations for you to make as well as lots, lots more. I will also update this blog a little more regularly once I have settled into my new full-time job. 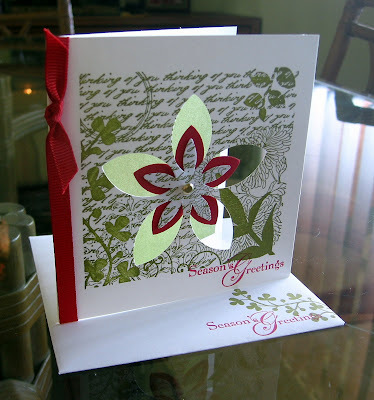 Recently I demonstrated a workshop for a group of new stampers..."hello Ladies". 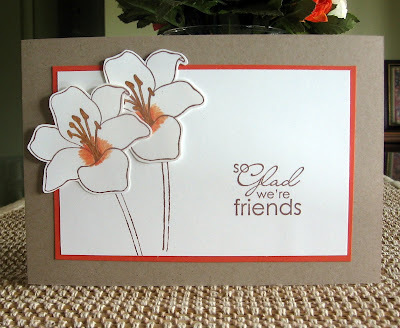 We made two cards, and the above is the second, where I showed the ladies how to use Stampin' Up! paper punches. 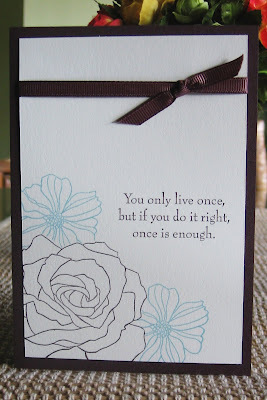 I love this card for several reasons, 1. it's quick to make and can be done as a one sheet wonder, 2. 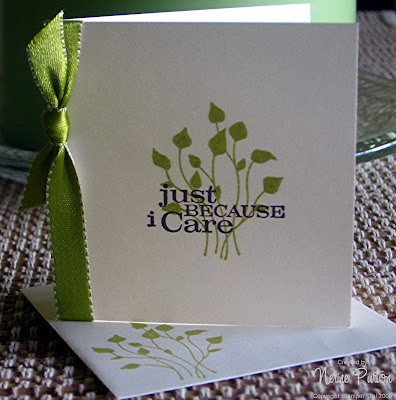 It maximises the use of whisper white cardstock...so it's very cost effective to make, and 3. It's simple. I hope you like this card as much as I do. * Snow Swirled & Best Yet Stamp Sets. * Whisper White, Real Red and Old Olive Cardstock. * Real Red & Old Olive Stamp Pads. * Scallop Edge Punch, Large Oval Punch & Scallop Oval Punch. Well, I'm back from the job hunt and am now employed again. I managed to score a finance position at my children's school which is very handy. What's even better, is I can have school holiday's off and I work predominantly within school hours. Now that I'm somewhat settled again, I managed to find some time to stamp and scrapbook. 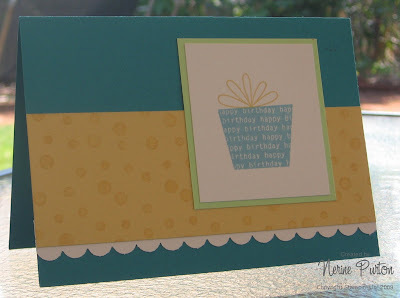 I recently purchased some Nestabilities from my friend Marcia's online store, The Stamp Spot, and I love them. So, today I actually plucked up the courage to use one of the more intricate designs and use the emboss facility as well. I hope you like today's card. * Snow Swirled & Many Merry Messages Stamp Set. 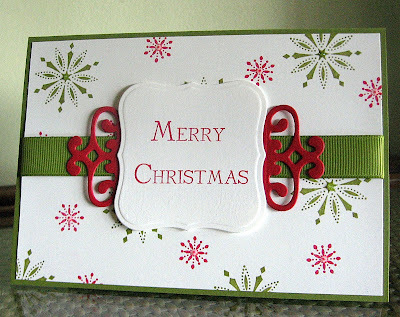 * Old Olive, Whisper White & Real Red Cardstock. * Old Olive & Real Red Ink. * Old Olive Wide Grosgrain Ribbon. Stampin' Dimensionals & SAMJ. * Kindy Glitz & Nestabilities. I just wanted to jump on quickly and let you all know that I haven't forgotten to create, I'm just very busy until the end of the week. As my youngest starts school next year, I've been applying for a few jobs and the time it takes to prepare resumes and address selection criteria, as you can imagine is extensive. Please keep your fingers crossed for me though, and I'll try to post again on the weekend. 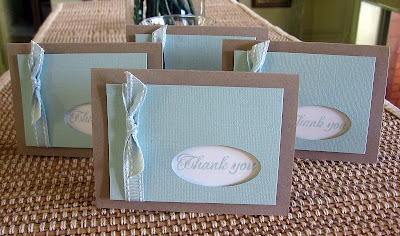 Above are some quick and easy thank you cards I recently made. I'm ashamed to say I didn't come up with this idea, I CASed it almost in it's entirety from a lady by the name of Debbie Petersen (no blog). I have changed the colour, ribbon, punch and sentiment however! The cards look great IRL due to their 3 Dimensional aspect. * Fresh Cut Stamp Set. 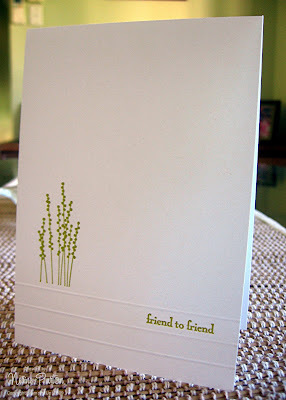 * Kraft, Whisper White and Soft Sky Textured Cardstock. * Large Oval Punch, Dimensionals, Mini Glue Dots & Soft Sky Ribbon. Note: Soft Sky products are now retired. Well, school holiday's have finished and I'm home again from a quick trip away with the kids (hubby's been away somewhere else for work). So, I finally have a chance to post this little gift bag I made using up some scrap cardstock and DSP I had. This project took virtually no time at all to make up, and contains a cello bag full of goodies within. Another bonus is it's stable enough to stand of it's own accord...even with the fans on as fast as they will go. They'd be great for functions or weddings and could be done with any colour scheme. 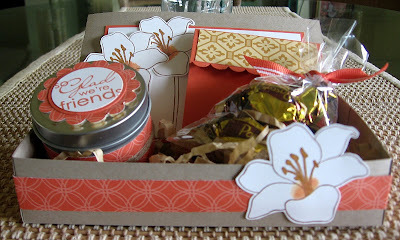 * Baroque Motifs & Great Friend Stamp Sets. 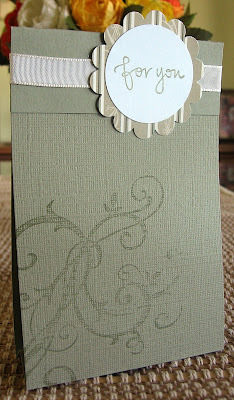 * Mellow Moss Textured 12x12, Mellow Moss Cardstock, Very Vanilla Cardstock & Le Jardin DSP (retired). * Scoring blade, Cello Bag, Scallop Circle Punch, Mini Glue Dots & Very Vanilla Taffeta Ribbon. 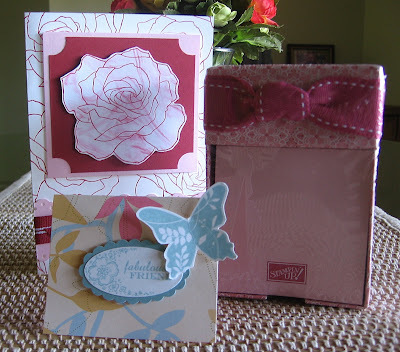 I'm still playing with my Fifth Avenue Floral set, and today I have a card and gift I made recently for a friend of mine. This friend is a loving wife and Mother. She works full time and manages to run her household and get the kids to school on time. Anyway, I thought she could use a little something to brighten her day. Above is the card which was inspired by a lady called Maureen (no blog), and below is the little gift box I made. Within the box is an Earl Grey Tea Bag (in a tea bag holder), a handmade Fruit Tingle candle and some chocolate eclairs. I hope she manages to take time out for herself to enjoy her gift. * Fifth Avenue Floral & Best Yet Stamp Sets. 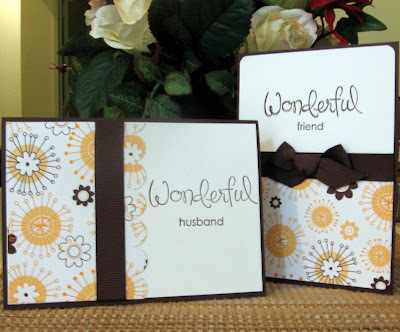 * Craft, Tangerine Tango & Whisper White Cardstock. Haiku DSP. * Close to Cocoa, Tangerine Tango & More Mustard Stamp Pads and/or Markers. * Mini Glue Dots, 1/1/4" & 1/3/8" Circle Punches, Scallop Punch, Tangerine Tango Grosgrain Ribbon, Small & Large Cello Bags and Linen Thread. As some of you will remember, after recieving a gift a few weeks ago which used the Fifth Avenue Floral set (thanks again Karen), I just had to rush out and buy it myself. Well, today I had a chance to play with it, and this is what I created. Again, it's another simple card, but I'm very happy with the way it turned out. As always, I hope you like this creation as well! * Fifth Avenue Floral Set. 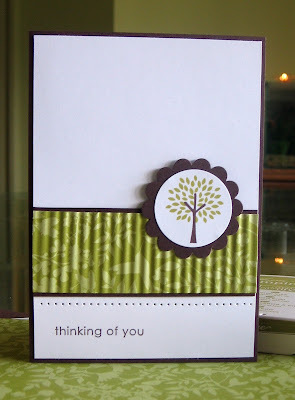 * Chocolate Chip & Very Vanilla Cardstock. * Chocolate Chip & Baja Breeze Stamp Pads. * SAMJ, Mask, Snail, Mini Glue Dots & 1/4" Chocolate Chip Grosgrain Ribbon. 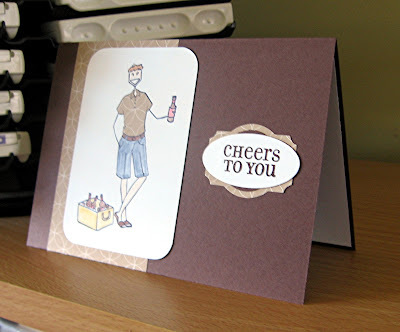 Tonight I'd like to show you a free standing pop up card I demonstrated recently at an in home workshop. Prior to making this card, I'd never made anything like this before and I can guarantee it won't be the last time either...they were so much fun! I obtained my inspiration from a lady called Sarah-Jane who has a lovely blog definitely worth checking out. I changed her traditional style card into the above and I love the way it turned out. 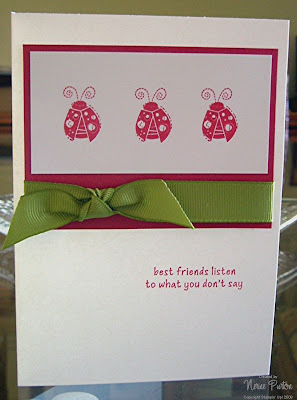 * Great Friend Stamp Set. * Kraft, Whisper White, Certainly Celery & Pink Pirouette Cardstock. * Certainly Celery, Pink Pirouette & Close to Cocoa Stamp Pads. * 1/3/8 & 1/1/4 Circle Punch, Trimmer with scoring blade, Sticky Strip, Crop-a-dile, Pink Pirouette Grosgrain ribbon. How lucky am I! Last week I received this lovely little 'Thank You' package from my upline Karen who was thanking me for all the hard work and creativity I put into my Stampin' Up! business. It was quite humbling because Karen is such an inspiration to me and I think I should be the one thanking her- not the other way around! In the parcel was a beautiful card using the Fifth Avenue Stamp Set - which I've now had to order. There was also a lovely pack of boxed note papers and a chocolate (which I ate prior to photographing but belongs with the Fabulous Friend bag topper at the front of the picture). 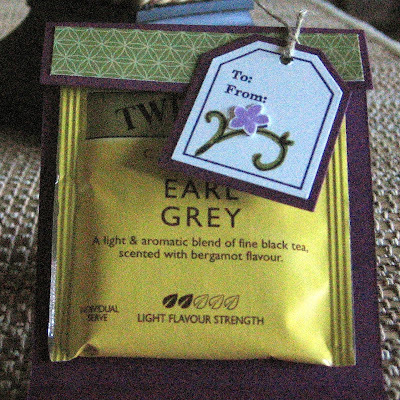 Thank you for this lovely gift Karen, you made my day and made me feel very special. I've been having so much fun lately now that I'm back stamping and doing workshops again. A big THANK YOU to all my hostesses, firstly for getting me back into the swing of things and secondly for reviving my love of stamping. A recent hostess asked if we could make Christmas Tags...it is after all creeping up on that time of year again. Well, after some research and final inspiration from Laurie, I came up with this creation. Once again, there quick and easy to make...which I'm sure the ladies can attest too. I hope you like today's creation. * Baroque Motifs Stamp Set. * Kiwi Kiss & Riding Hood Red Cardstock. * Encore Gold Stamp Pad. * Round Tab Punch, Piercing tool, Gold Embossing Powder, Gold Brads, Crop-a-dile & Riding Hood Red Stripped Grosgrain Ribbon, Heat Tool & Sticky Strip. * CM Circle Cutting System (Non SU product). Today I've created a Thank You card using the layout from one of my favourite blogs "Clean & Simple" (check out my side bar for the link). I hope you like today's card. * Apricot Appeal, Whisper White & Ballet Blue Cardstock. Sarah DSP (retired). * Chocolate Chip, Ballet Blue & Apricot Appeal Stamp Pads. So, not wanting to be left out altogether, I decided to make some Christmas cards at home using up past workshop scrap's. The above is the first card I made using a new set I've recently purchased - Snow Swirled. This card was super simple to make and took literally 10 minutes at the most. I know my friends love simple cards and I hope they like this one too. * Snow Swirled Stamp Set. * Riding Hood Red, Kiwi Kiss & Very Vanilla Cardstock. * Riding Hood Red & Kiwi Kiss Stamp Pad. Just over a week ago, I demonstrated a workshop for some lovely ladies...hello ladies! 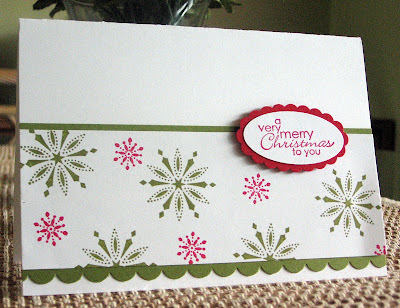 One of the cards we made was the above Christmas Card which was inspired by a similar card in the Stampin' Up! 09/10 Idea Book and Catalogue. The card itself was just so easy to make and took no time at all. I can definitely see the advantages to using the Fresh Cut Notes for that extra WOW effect, and I know the ladies who attended loved them. I hope you do too! * Fresh Cuts & Snow Swirled. * Fresh Cut Notes, Real Red and Old Olive Cardstock. * Real Red and Old Olive Cardstock. 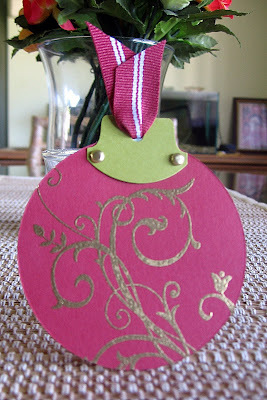 * Real Red Grosgrain Ribbon, SAMJ (which is a must for this project), Gold Brads, 5 Petal Punch & Sticky Strip. One of my SBS27 sisters - Julie is giving away some amazing blog candy this week to celebrate her 'blogaversary'. Be sure to visit her blog HERE for your chance to win. Julie's willing to post anywhere so it's well worth stopping by for a visit. She's also an amazing artist so even if you don't win the candy, you'll reap rewards anyway...just of a different nature. Thanks Julie for your generosity and congrats on your anniversary! Well, although I didn't publicise it, I'm now back from a lovely holiday to Kununurra, Broome, Port Headland, Carnarvon, Monkey Mia, Perth, Kalgoorlie, the Nullabor, Port Augusta, Coober Pedy, Ayers Rock and Alice Springs...some 12,000km of driving. On top of this we received our new computer today so I can once again post on my blog once I've installed my camera software. I've a few creations to show you, so check back in a few days for some recent work I've done and some more regular posts. Before I go however, thank you all for your lovely comments and for being patient with my technological woes. I just thought I'd pop in quickly to post one of the cards I made recently. I've taken the colour scheme from a card made by Julie Davidson and I've used the Big Bold Birthday stamp set for the image. I hope you like this little (and quick) creation. Soon school holidays will be over and I'll have my new computer to replace my current one (which is very temperamental and dodgy) which will allow me to post more consistently. So keep tuned, I will return with more creations when I can. * Big Bold Birthday Stamp Set. * Taken with Teal, So Saffron, Whisper White & Gable Green Cardstock. * Taken with Teal & So Saffron Stamp Pads. Men's cards are particularly hard to make, but I have to admit, this one came together so easily and I'm really happy with the end result. I've paper-pieced my fella's shirt using the same decorative paper that I've used to back the image and sentiment. To colour my fella, I've used a blender pen with ink which gives a subtler effect than markers. My colours have been chosen because of their masculine qualities more than anything else. Normally I'd list my supplies here, but I'd prefer to post today instead of getting into the nitty gritty of things. If you need more info just let me know and I'll get back to you, but the products I've used are from Bella Stamps, Stampin' Up! and Creative Memories. Don't they all just compliment each other so nicely! Today I decided to alter a little hard covered index book I had. I really wanted to use up some scrap pieces of cardstock, and some retired DSP which I've had for a few years now. I also knew I wanted to make the 'grass' around the tree as 3D as I possibly could. To enhance this effect, I've then also faux embossed the main image. I hope you like today's creation which I've made for a friend. 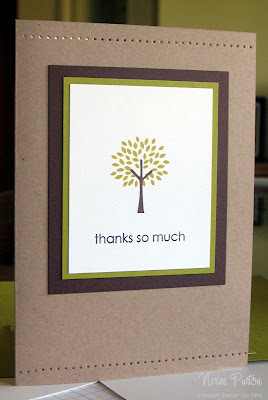 * Trendy Trees & Warm Words Stamp Sets. 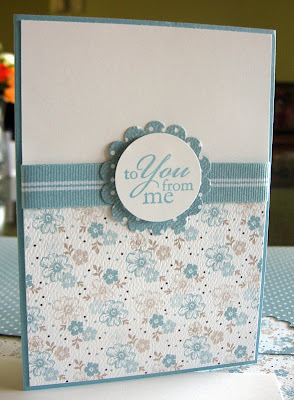 * Close to Cocoa, Mellow Moss and Brocade Blue Stamp Pads. * Whisper White, Bashful Blue & Mellow Moss Cardstock. Pool Party DSP (retired). * Bashful Blue Striped Grosgrain Ribbon. 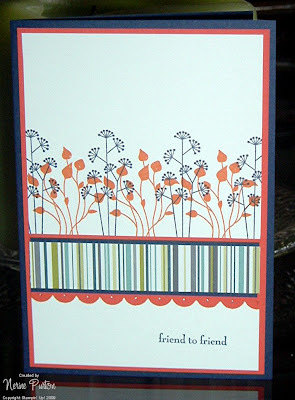 I always get so excited when I find a new blog that has, what I think is a similar stamping style to my own. 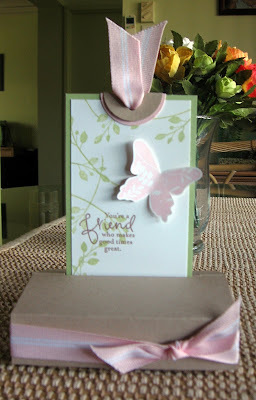 Thanks to one of my SBS#27 sisters (Hello Heather) I have found the Clean & Simple Stamping blogspot. Above is my contribution to their FTL#41 Layout Challenge. I'm going to add the Clean & Simple Stamping blogspot to my favourites list as well as my "other blogs I visit" section to the right of this post. Their creations are amazing and just like their name, everything is just so simple while still very eye catching. * Garden Whimsy Stamp Set. * Whisper White and Red Riding Hood Cardstock. * Red Riding Hood Stamp Pad. * 3/8" Old Olive Grosgrain Ribbon & SAMJ. 3. Use at least 1 Stamp Set that is new to the 09/10 IB&C. The above is my contribution and again, I've used my favourite Pocket Silhouette's. I've steered clear of colours that I'd normally use and really stepped out of my comfort zone for this creation. I'm really happy with the way it turned out and my only regret is that I didn't have the eyelet boarder punch to use in lieu of the scallop boarder punch. * Pocket Silhouette's Stamp Set. * Night of Navy, Tangerine Tango, Whisper White Cardstock & Urban Garden DSP. * Night of Navy & Pumpkin Pie Stamp Pads. * Piercing Tool, Scallop Boarder Punch, SAMJ & SNAIL. Friend to Friend & Late Tuesday Challenge. 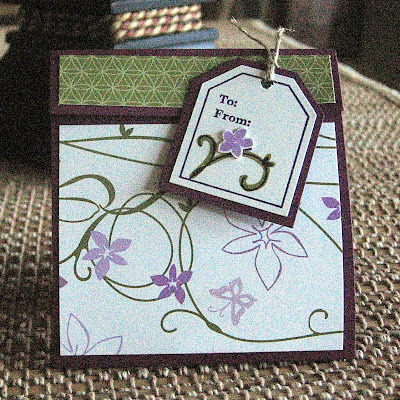 Here's another of the cards I churned out on Sunday night when I was 'in the mood' to stamp. We all know I love single layer cards, and I have to say, I'm really happy with this. The scoring along the bottom of this card really finishes it off. So, as I missed a layout challenge yesterday I thought I might challenge you all today to make a card using scoring as an embellishment. The layout can be what ever you want it to be, just so long as there's scoring on the card front somewhere. To score my card, I've used my fiskers trimmer with the scoring blade, however this effect can just as easily be created using a bone folder and ruler. Have fun! * Pocket Silhouettes Stamp Set. * Kiwi Kiss Stamp Pad. * Fiskers Trimmer & Scoring Blade. Marcia: Who often pops in to say hello and who's blog is absolutely awesome. Marcia's such an inspiration to me...thank you! Chrissie: Who again often pops in to say hello and to see what I've been up too. Chrissie's work is amazing and I especially like all the little things she makes at Christmas and Easter time for all the children she teaches. Natasha: My lovely sister demo who lives just down the road. 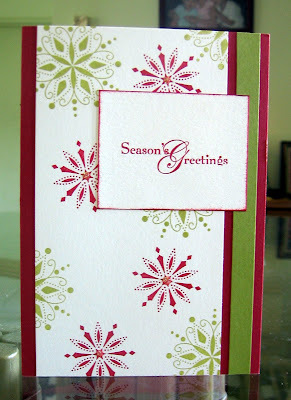 I love Natasha's stamping style and she constantly amazes me with her wonderful creations. Leah: Has a lovely blog and updates is regularly. I love seeing what she's done with all the challenges she participates in as her work is fantastic. Thank you for all the lovely work you do ladies you all keep me inspired and trying to do my very best work. I hope you enjoy your award.